赵奇, 高丽君, 张玉勤, 高亚平, 高平, 王萌萌, 周可会, 刘吉起. 河南省开封及安阳市2012-2016年淡色库蚊对常用杀虫剂的抗药性趋势分析[J]. 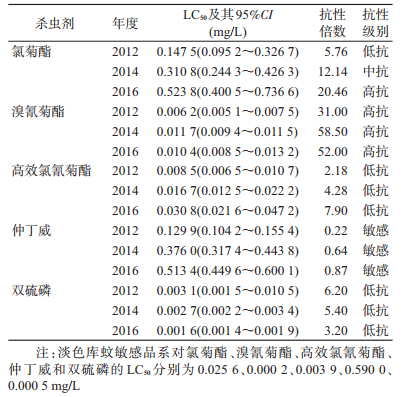 中国媒介生物学及控制杂志, 2018, 29(6): 648-650. ZHAO Qi, GAO Li-jun, ZHANG Yu-qin, GAO Ya-ping, GAO Ping, WANG Meng-meng, ZHOU Ke-hui, LIU Ji-qi. Analysis on resistance trend in Culex pipiens pallens to different insecticides in Kaifeng and Anyang in Henan province during 2012-2016[J]. Chin J Vector Biol & Control, 2018, 29(6): 648-650. Corresponding author: LIU Ji-qi, Email:hncdcljq@sina.com. Abstract: Objective Survey the resistance trend of Culex pipiens pallens to Permethrin, Deltamethrin, beta-Cypermethrin, Fenobucarb, and Temephos in Kaifeng and Anyang, to provide scientific guidance for chemical prevention. Methods Larvae were collected from flower gardens or abandoned pools and so on in the urban area of Kaifeng and Anyang from June to August in 2012, 2014, and 2016. 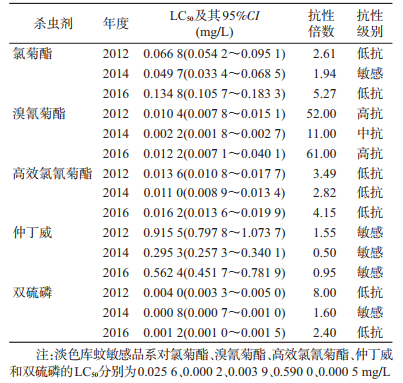 Results The median lethal concentration (LC50) of the Kaifeng population against Permethrin in 2012, 2014, 2016 were 0.147 5-0.523 8 mg/L, the resistance ratios were 5.76-20.46 fold; against Deltamethrin were 0.006 2-0.011 7 mg/L, the resistance ratios were 31.00-58.50 fold; against beta-Cypermethrin, Fenobucarb and Temephos were 0.001 6-0.513 4 mg/L, the resistance ratios were 0.22-7.90 fold. 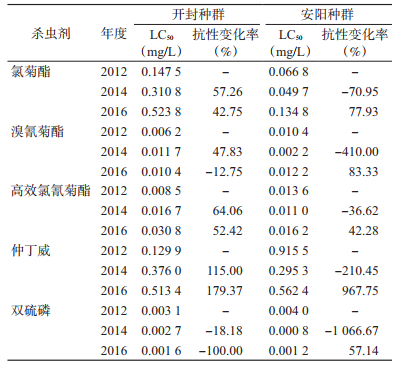 The LC50 of the Anyang population against Permethrin, beta-Cypermethrin, Fenobucarb and Temephos were 0.000 8-0.915 5 mg/L, the resistance ratios were 0.50-8.00 fold; against Deltamethrin were 0.002 2-0.012 2 mg/L, the resistance ratios were 11.00-61.00 fold. Conclusion Culex pipiens pallens in Kaifeng and Anyang showed different levels of resistance to pyrethroids and organophosphorus insecticides, but still susceptible to carbamate insecticides. The strategy of mosquito control in Kaifeng and Anyang should focus on source reduction. Chemical control should be limited, scientific and effective. 中华人民共和国国家质量监督检验检疫总局, 中国国家标准化管理委员会. GB/T 26348-2010蚊虫抗药性检测方法不敏感乙酰胆碱酯酶法[S].北京: 中国标准出版社, 2011. 唐振强, 张玉勤, 刘吉起, 等. 蚊蝇对常用杀虫剂的抗药性调查研究[J]. 中华卫生杀虫药械, 2010, 16(5): 360-361. 赵奇, 高丽君, 钱丹, 等. 河南省卫生杀虫剂使用现状调查[J]. 中华卫生杀虫药械, 2015, 21(1): 26-28. 李东丽, 高亚平, 唐振强, 等. 开封市区淡色库蚊对常用卫生杀虫剂的敏感性测定[J]. 医药论坛杂志, 2011, 32(23): 120-121.